We love adding letters to plain old crafts and making them into an alphabet craft. 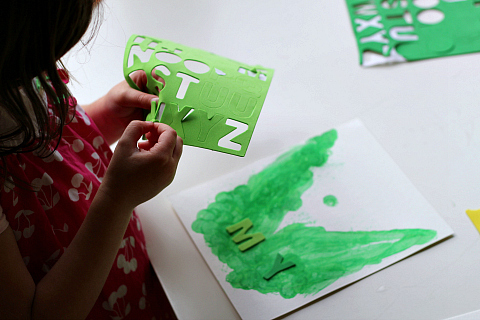 It’s a simple way to work on letter recognition and kids love it. 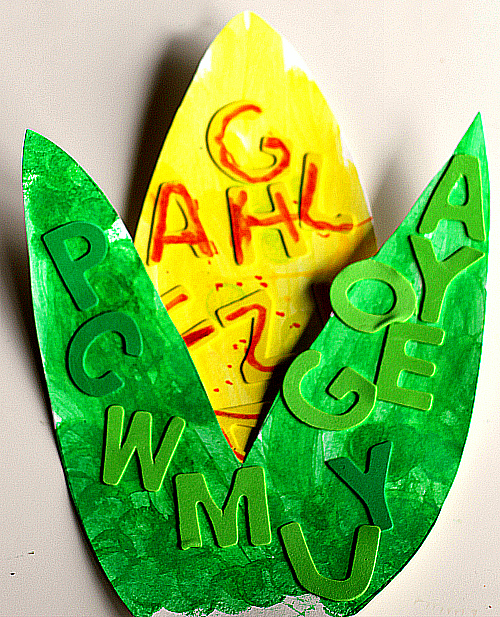 This simple ear of harvest corn went from plain to rad with some letters. 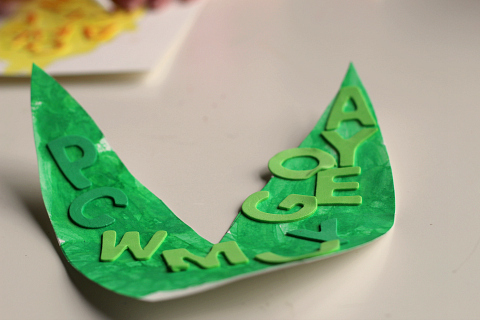 More importantly my daughter spent time with each letter making it’s sound, suggesting words that also make that sound, and really being engaged. I didn’t plan on her tracing the letters with a marker but I loved her suggestion. I always run with her suggestions because even though I came up with the idea this is HER creation and I don’t want her to think there are steps so much as options. 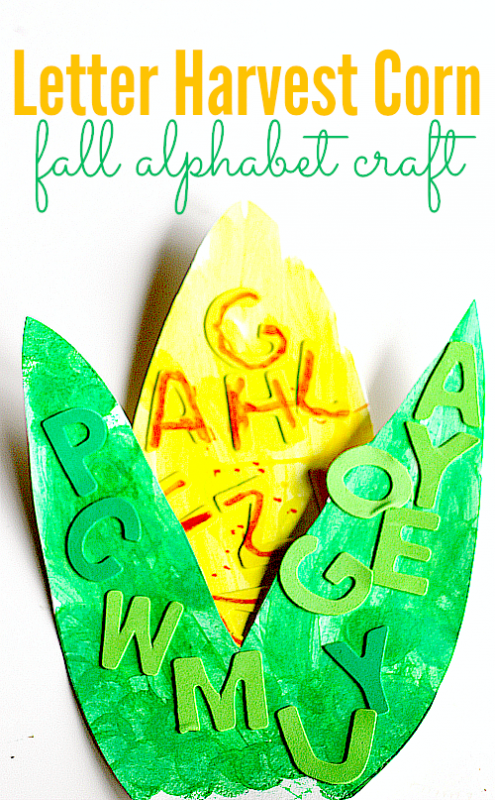 So try adding some letter stickers to whatever you are creating to turn a simple craft into a literacy activity. Gather your materials. 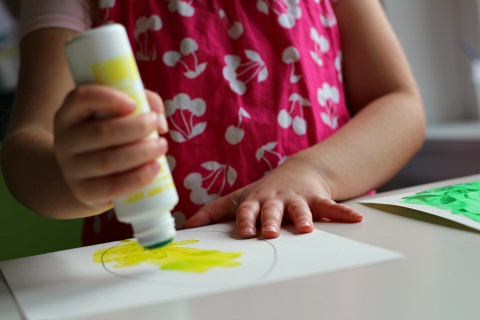 You will need some watercolor paper, a pencil, scissor, foam stickers in any color but we chose to match ours, some paint ( use paint daubers if you want them to dry quickly), and some glue or double stick tape. 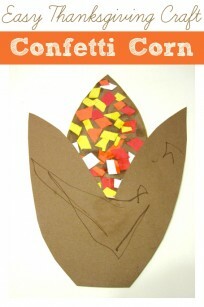 Start by drawing an ear of corn and the stalks separately. Time to paint. 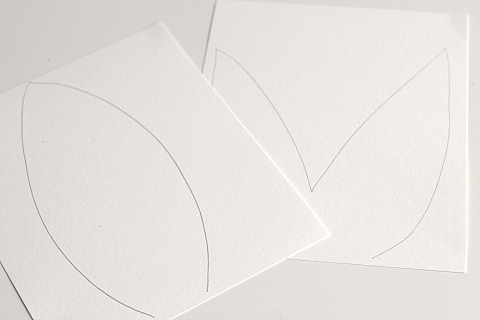 These Do A Dot Art ( affiliate link) really do dry quickly especially when you use water color paper. Kids love them too. My class and I just did a variation of this number art project with them and they painted for ages! As you can see I didn’t cut the pieces out. 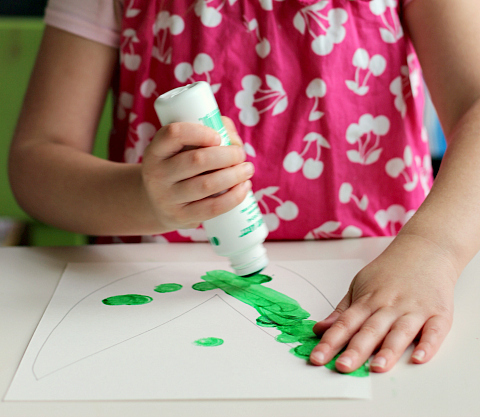 Over the years I have discovered kids will paint all the way to the edges if you leave it but if you cut the shapes out they will often paint in the middle only. 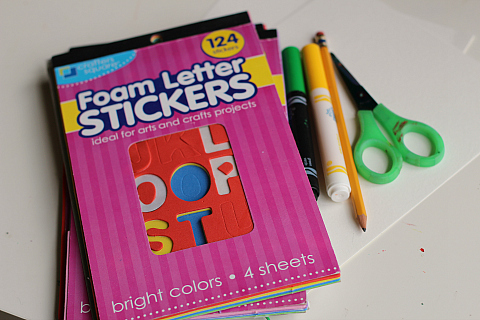 When both are done you can grab the foam letters and play a little game of ” Can you find the letter…” while the paint dries. Add on the letters. 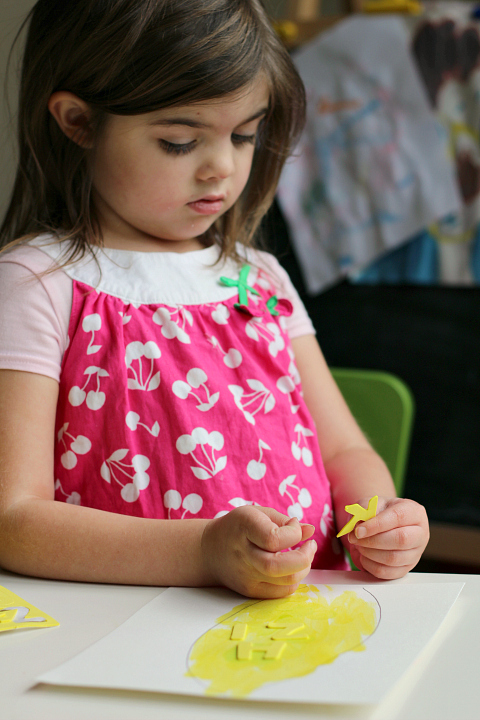 Peeling stickers of the backing is a valuable fine motor activity so let them take their time and only help if they ask. No need to rush. 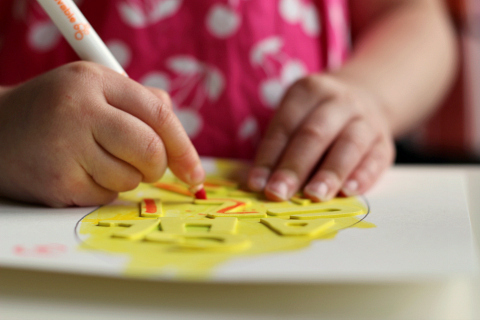 After she popped the yellow letter stickers on she decided to trace the letters with a red marker. It took a lot of concentration and hand control. I thought it was rad. 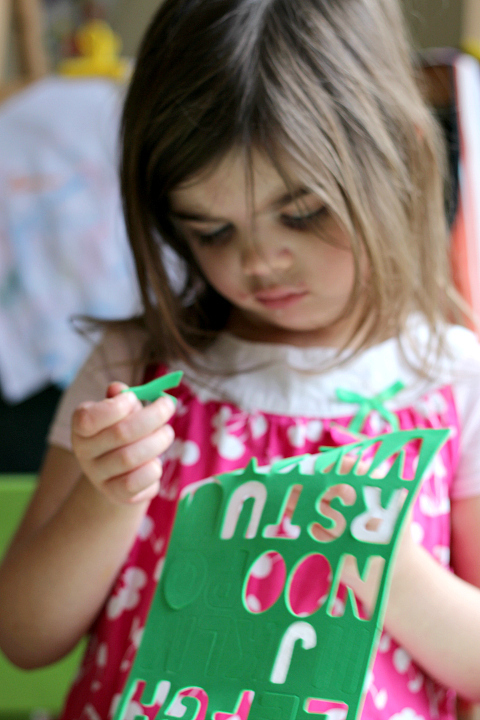 Cut out and glue or tape together with double stick tape. All done! 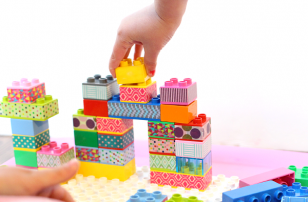 Don’t forget to display it someplace where your child can see all their hard work! 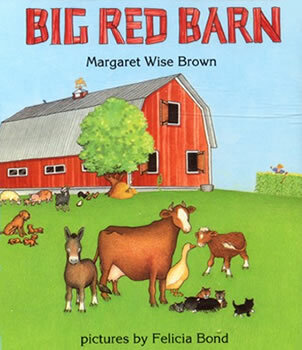 Big Red Barn by Margaret Wise Brown is one of my very favorite books to read to my daughter before bed although it took a while before she warmed up to it. I was worried because I loved reading it to my son and couldn”™t wait to share it with her. 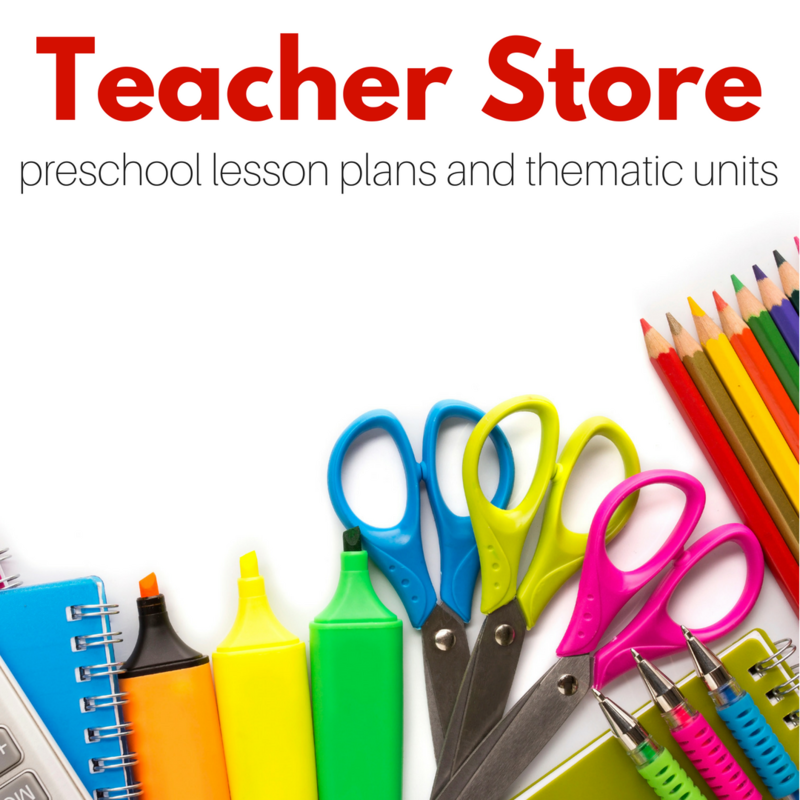 The story is simple readers see a day in the life of a big red barn and all the animals inside. Each animal is introduced in the seamless text that reads like a melodic poem. It”™s calm , soothing and Felicia Bond”™s illustrations are perfect, I love how the sky subtly changes as the night beckons. A wonderful book for anytime, but especially poignant before bed. 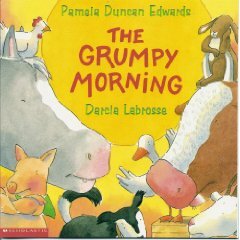 The Grumpy Morning by Pamela Duncan Edwards is a great book. I think I got it as a freebie with a scholastic order years ago, either way I am so glad I have it. The book follows all the animals on a farm as they wake up grumpy and hungry and needing attention from the farmer.As a parent I like this because it’s a great reminder that we need to feed our bodies for the day to be at our best. As a teacher I love this book because I could talk about whining, and demanding and ask my students if there are better ways to get what you want. 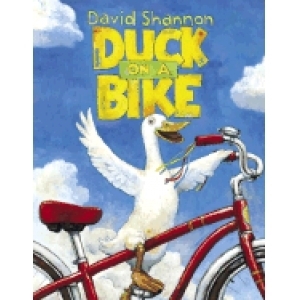 Duck on a Bike by David Shannon tickles my funny bone. I love this book, the message is awesome too. Just because it”™s never been done before doesn”™t mean that you shouldn”™t try. Also how cute is a duck riding a bike? Kids even young ones get the message loud and clear as well. The illustrations are amazing and your child will love the farm animals and the tractor at the end. Oh and please tell me I am not the only one waiting for “Duck on a Tractor” ? I”™d buy it in a heartbeat ! 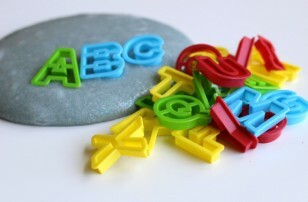 Previous Post: If you have 30 extra minutes to work on literacy what would you spend it doing? 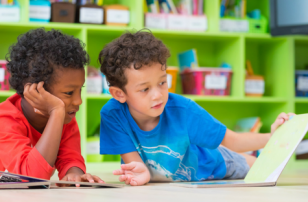 Simple ways parents can help their kids read.